Les Annales Françaises de Médecine d’Urgence publient des articles originaux, des revues de la littérature, et des cas cliniques dans tous les domaines de la médecine d’urgence y compris dans le domaine des urgences collectives. Prolapsus stomial : sucrer avant réduction ! Authors: T. Schmutz, P. Stengel and V. Ribordy. Authors: Y. Freund, P.-G. Claret, M. Maignan, K. Tazarourte and A. Ricard-Hibon. Authors: P.-G. Claret, P. Le Conte, M. Oberlin, A. Clément, M. Pouquet and A. Marchal. Authors: C.-H. Houzé-Cerfon, D. Lauque, E. Wiel, V. Bounes and S. Charpentier. Keywords: Compétence ; Médecine d’urgence ; Simulation ; Competency ; Emergency medicine ; Simulation. Authors: M. Pasquier and M. Blancher. Keywords: Arrêt cardiaque ; ECMO ; HOPE score ; Hypothermie ; Température ; Cardiac arrest ; Extracorporeal life support ; Score ; Hypothermia ; Temperature. Authors: A. Warnant, T. Moumneh, P.-M. Roy and A. Penaloza. Keywords: Douleur thoracique ; Médecine d’urgence ; Score diagnostique ; Syndrome coronarien aigu ; Chest pain ; Emergency room ; Diagnostic score ; Acute coronary syndrome. Authors: X. Bobbia, P.-G. Claret, R. Perrin-Bayard and J.-E. de La Coussaye. 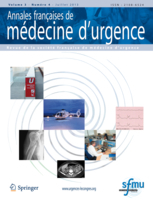 Keywords: Médecine d’urgence ; Échographie clinique ; Point-of-care ; Ultrasound ; Emergency medicine. Authors: J.-G. Meusnier and N. Cazes. Authors: J. Gennesseaux, L. Faroux and S. Gennai. Authors: T. Marx, S. Kepka and T. Desmettre. Keywords: Pneumothorax ; Exsufflation ; Urgence ; Pneumothorax ; Aspiration ; Emergency. Keywords: Simulation ; Pédiatrie ; Réanimation cardiopulmonaire ; Arrêt cardiorespiratoire ; Pédagogie ; Simulation ; Pediatrics ; Cardiopulmonary resuscitation ; Cardiac arrest ; Pedagogy. Authors: C. Gerlier, T. Poinsat, M. Sitbon, H. Beaussier, J. Corny and O. Ganansia. Keywords: Conciliation médicamenteuse ; Service des urgences ; Erreur médicamenteuse ; Facteurs de risque ; Pharmacie clinique ; Medication reconciliation ; Emergency care unit ; Medication error ; Risk factors ; Clinical pharmacy. Authors: D. Douillet, A. Fieni and B. Carneiro. Authors: T. Bathoum, F. Lienart and F. Guerisse. Authors: P.-G. Claret, D. Rerbal, A. Chauvin, A. Gloaguen, J.-P. Desclefs and B. Douay. Authors: M. Borel, C. Damm, B. Debien, H. Akodad, E. Dolla, A. Bouhaddou, F. Lamberdière and M. Raux. Keywords: Amavi ; Plan blanc ; SSE ; Exercice ; Hôpital ; Mass casualties ; Disaster ; Drill ; Hospital. Authors: S. Stamboul, L. Boussarie and P.-C. Thiebaud. Authors: A. Aubrion, M. Morin, E. Roupie and R. Macrez. Keywords: Hospitalisation pertinente ; Hospitalisation justifiée ; Grille AEPf–DMS 24 heures ; Appropriate hospitalization ; Inappropriate but justified hospitalization ; Appropriateness ; Evaluation protocol ; Length of stay. Authors: M. Chabannon, G. Cayla and J.-E. de La Coussaye. Authors: J. Jacquet, G. Catala, J.-P. Machiels and A. Penaloza. Keywords: Neutropénie ; Fébrile ; Ambulatoire ; Risque ; MASCC ; Neutropenia ; Febrile ; Outpatient ; Risk ; MASCC. Authors: S. Köhl, M. Lutchmaya and P. Ray. Authors: F. Balen, B. Ribere and M. Bastouil. Authors: C. Marçais, A. Chetioui, Y. Yordanov, P.-G. Reuter, P.-A. Raynal, D. Pateron and P.-C. Thiebaud. Keywords: Médicaments ; Urgence ; Préhospitalier ; Smur ; Drugs ; Emergency ; Prehospital ; Smur. Authors: L. Moulin, F. Heraud and E. Dubie. Authors: N. Vialaret Du Val De La Croix, M. Oberlin, E. Dehours and S. Charpentier. Keywords: Grippe ; Urgence ; Professionnel de santé ; Vaccination ; Influenza ; Emergency ; Healthcare workers ; Vaccine. Authors: M. Perrier and S. Deffarges. Authors: L. Lemoine, M. Legrand, G. Potel, P. Rossignol and E. Montassier. Keywords: Hyperkaliémie ; Arythmie cardiaque ; Urgence ; Insuffisance rénale ; Bêta agoniste adrénergique ; Insuline ; Severe hyperkalemia ; Arrhythmias ; Cardiac ; Emergency treatment ; Renal insufficiency ; Adrenergic beta-agonists ; Insulin. Authors: M. Laroussi, A. Gaillard-Farrugia and D. Lamèche. Authors: M. Bilger, B. Wiest, F. Becmeur and P. Gicquel. Keywords: Traumatisme sportif ; Accident de la vie quotidienne ; Pediatric sports injuries ; Everyday accidents. Authors: S. Beroud, G. Passot and P. Rousset. Keywords: Antibiotiques ; Infections urinaires ; Service d’urgences ; Antibiotics ; Urinary infections ; Emergency department. Authors: E. Hansconrad and P. Plaisance. Authors: P. Taboulet, C. Maillard-Acker, G. Ranchon, S. Goddet, R. Dufau, C. Vincent-Cassy, Y. Yordanov and C. El Khoury. Keywords: Triage ; Infirmière ; Médecine d’urgence ; France ; Triage ; Nurse ; Emergency medicine ; France. Authors: E. Bedani, R. Girerd and E. Beti. Authors: A. Ray, E. Roupie and R. Macrez. Que peuvent apporter les sciences humaines et sociales à la recherche en médecine d’urgence ? Authors: M. Riou, A. L Feral-Pierssens, C. Tourette-Turgis, K. Tazarourte, Y. Freund, T. Pelaccia and B. Riou. Authors: P. Taboulet, C. Vincent-Cassy, P.-A. Squara and M. Resche-Rigon. Authors: S.-P. Corcostegui, M. David and P. Chiron. Authors: P.-G. Claret, J. Vaux, E. Cesareo, G. Valdenaire and B. Villoing. Authors: P. Catoire, M. Dubourg and G. Evrard. Authors: C. Lavoignet, M. Bousigues and H. Slimani. Authors: C.-E. Lavoignet, S. Huguonnot and H. Slimani. Authors: V. Jonquet and L. Chabot. Authors: F. Balen, L. Moreno and K. Daros Oudrhiri. Authors: C. Simon, J. Oliveira and X. Fontaine.